Although dentistry has developed new materials and techniques used in rehabilitation of edentulous patients, polymethyl methacrylate (PMMA) resins have dominated the denture base market for over 80 years. However, PMMA resins have certain disadvantages, such as porosity, water sorption, and solubility. Another important limitation is the deposition and formation of biofilm on the surface of PMMA resins  which acts as a reservoir of microorganisms and contributes to oral diseases and tissue damage. The intaglio surface of the denture is not polished before insertion so that rough uneven imperfect areas in the denture may serve as a breeding ground for opportunistic oral fungi. Poor oral hygiene causes the adhesion of microbial cells; possible dissemination of pathogens from denture biofilm in immunosuppressed patients can cause severe systemic infections. The management of denture-associated lesions relies on denture cleaning and disinfection, appropriate denture-wearing habits, and prescription of topical or systemic antifungal agents. However, the relapse of the infection is still high. Due to the limited compliance of some edentulous patients after denture insertion, it would be convenient if denture base materials could prevent biofilm formation. Various attempts to change properties of denture base resin have included the incorporation of anti-infectious agents, which would undergo gradual release in the oral cavity. However, the use of releasing agents is not suitable for long-term use. Their elution may deteriorate base materials and decrease their efficacy overtime. Alternative methods to reduce the adhesion of microorganisms have been tried by altering the surface charge of denture base resins. The adherence of Candida albicans to denture base surfaces in vitro has been associated closely with the hydrophobicity of the microorganism. C. albicans adheres more readily to hydrophobic surfaces than to hydrophilic surfaces. C. albicans, such as other living cells, has a net negative surface charge, providing an environment of electrostatic repulsion through the negative-negative charge interactions with the polymer. Understanding the effect of electrostatic interactions in the adhesion of C. albicans to PMMA, it can be suggested that negatively charged denture base materials can prevent adhesion of C. albicans and reduce the development of denture-induced stomatitis. Chemical modification of the surface charge of denture resin is a novel approach in preventing adhesion of C. albicans. 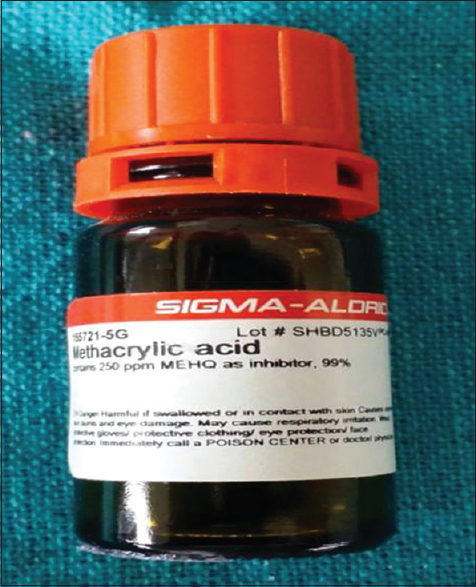 The main purpose of the present study was to investigate the effect of incorporation of an antimicrobial agent methacrylic acid (MA) in different concentrations on surface roughness and flexural strength of a heat-polymerized denture base material. 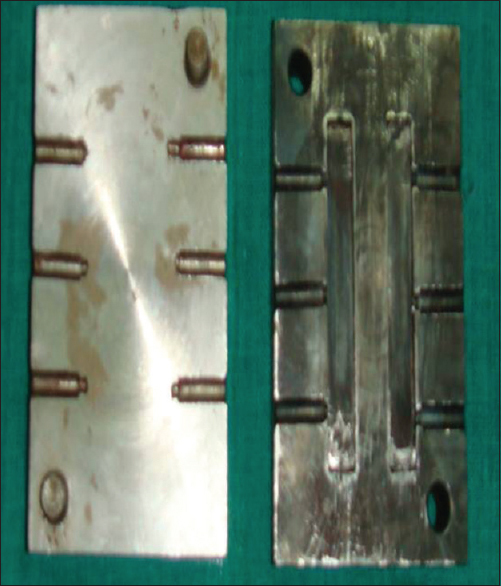 For the study, a precise, custom-fabricated metal mold was used to make test samples [Figure 1]. The mold consisted of two parts. The first part was a flat rectangular plate with dimensions of 8 cm × 6 cm × 0.2 cm and consisted of three inlets projected vertically to facilitate the flow of wax into the mold space. The second part of the mold consisted of rectangular-shaped mold space two in number each measuring 65 mm × 10 mm × 3.4 mm, according to the International Organization for Standardization of specimens. Wax patterns were obtained by pouring molten wax into the mold space. Ninety rectangular wax blocks were prepared with dimensions of 65 mm × 10 mm × 3.4 mm. 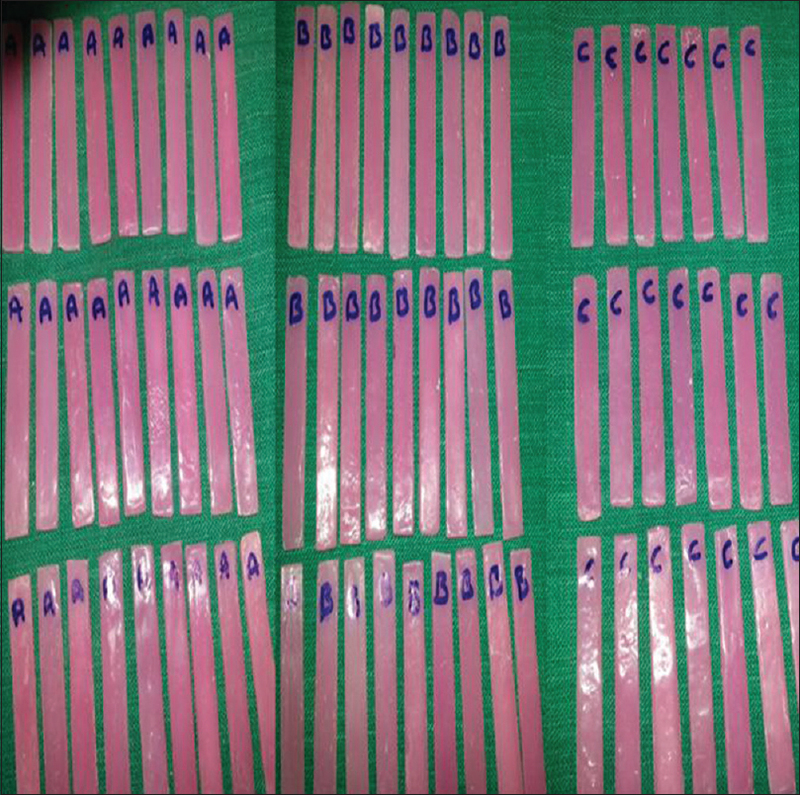 Of 90 wax blocks, 30 blocks each were grouped into three groups as mentioned in [Table 1]. The wax patterns were then invested in a dental flask, using dental stone plaster [Figure 2]. Once the plaster was completely set, dewaxing was done. The wax was removed by flushing away with hot boiling water. The mold space thus obtained was used for the preparation of the test samples. The flask was allowed to dry and cool at room temperature. Then, separating agent (cold mold seal; Dental products of india (DPI)) was applied with the help a camel hair brush on all surfaces and allowed to dry. Set of 30 wax molds of, was packed with heat cure acrylic denture base resin in the ratio of 1:3 monomer and polymer as per the manufactures instructions which will be used as control group. Another set of 30 wax molds was packed with 10% MA, and another set of 30 wax molds was packed with 20% MA monomer. MA (Sigma-Aldrich) [Figure 3] was added as a third component, whereas the others were mixed according to the manufacturer's recommended proportion. Using one pipette, required volume of monomer was transferred to a clean, dry, airtight porcelain mixing jar. 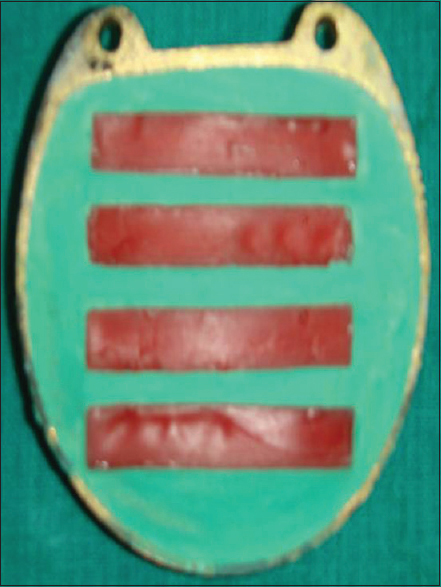 Both the monomer and polymer were mixed with a clean dry wax spatula, and the packing was done in the dough stage. The specimens were bench cured for 1 h and polymerized by curing cycle according to manufactures instructions. After processing, the specimens were bench cooled and then deflasking was done. The excess resin and plaster on the specimens were trimmed with metal and acrylic trimmers. Specimens were finished with various grits of sand paper 180,220,400 and then polished with pumice. Thickness, length, and width of each specimen were verified [Figure 4]. 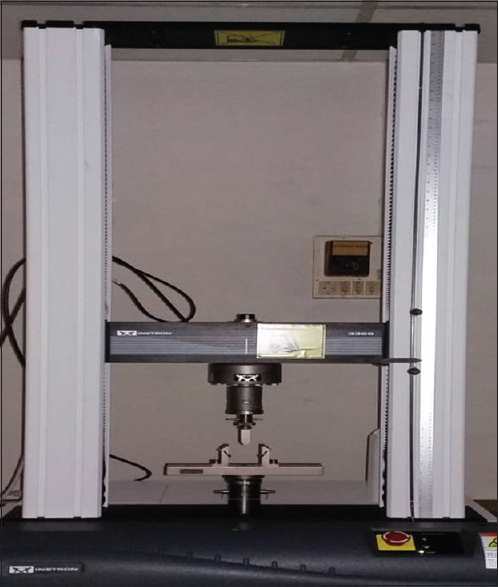 Flexural strength of each group was measured using universal testing machine (Instron 3369) with three-point bending test at a crosshead speed of 5 mm/min [Figure 5]. All the specimens were marked in the center. The customized jig was positioned on the jaws of universal testing machine which were parted 50 mm, and the specimens were loaded one at a time. Load was applied at the center of the specimen at a crosshead speed of 5 mm/min until it fractured [Figure 6]. The machine has a digital monitor which indicates the amount of force being applied to the test specimen. When the specimen breaks, the reading on the digital scale automatically stops, and the indicator light will get switch off, thus indicating the fracture load. The load at which fracture occurred was noted automatically by the monitor connected to the testing machine, and the flexural strength was calculated using the following formula by an internal software in the monitor connected to the universal testing machine. The surface roughness was measured on the same specimens after assessing the flexural strength at the extremities of the specimens after fracture. 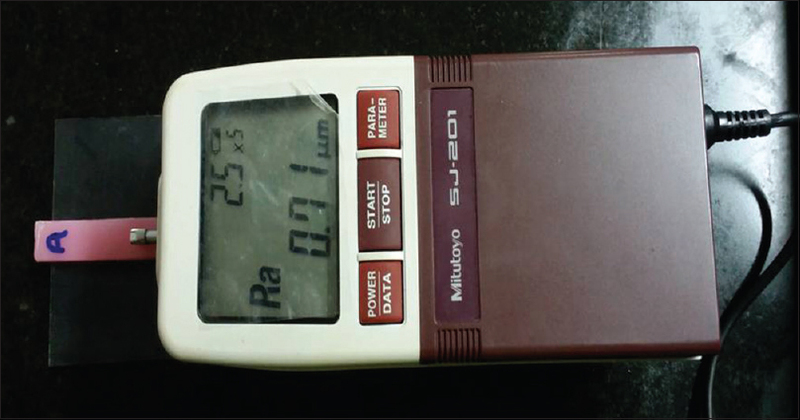 The Surface Roughness Tester SJ-201P (Mitutoyo Corp, Kawasaki, Japan) was used to measure the specimen surface roughness [Figure 7]. 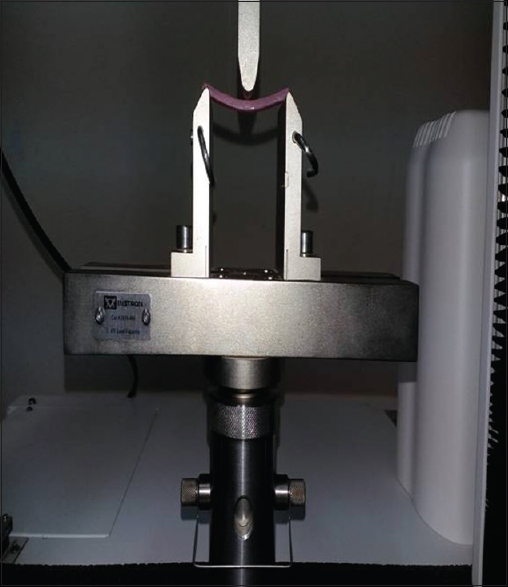 The profiler of the surface roughness tester was set to move a diamond stylus across the specimen surface under a constant load. The surface topography was measured using a linear variable differential transformer. The surface roughness was calculated from evaluation of the numerical values of the surface profile. The Ra value describes the overall roughness of a surface and is defined as the mean value of all absolute distances of the roughness profiles from the mean line within the measuring distance. Five measurements with a length of 4.8 mm and incremental distance of 1 mm between each scanning line were carried out for each specimen. The mean Ra was calculated from five lines as the mean roughness of the specimen. In the present study, ANOVA was applied to find the significance of mean flexural strengths and surface roughness between three of specimens [Table 2] and [Table 3]. Once it is determined that differences exist among the means, post hoc range tests and pair-wise multiple comparisons tests were applied. Tukey's honestly significant difference test is one of the widely used post hoc tests [Table 4] and [Table 5]. The results of the study indicated that correlation existed between the physical properties and concentration of the antibacterial agent in surface-charged resins. From above results, P value was calculated. P < 0.05 revealed a significant difference between flexural strength of specimens of three groups. No significant difference was found in surface roughness of control Group A and test Groups B and C. The values of mean surface roughness followed the null hypothesis. In the present study, decrease in the flexural strength was observed when the ratio of the MA increased in the proprietary monomer. A slight increase in the surface roughness was observed as the concentration of MA increased. The significant number of denture wearers develops Candida- associated infections of the palatal mucosa underneath the upper denture. Denture-induced stomatitis is the description used for the pathologic changes found in the oral mucosa of the denture-bearing tissues. The observed mucosal changes present as a bright erythema found under complete or partial dentures in the maxilla and the mandible but most commonly in the maxilla where denture contact area is much greater. The mucosal lesions are multifactorial in nature, but the most common significant pathogen isolated is the fungal species C. albicans.C. albicans has been found on and isolated more often from the actual fitting surfaces of dentures and in higher numbers then on the mucosal tissues. Successful colonization of the superficial epithelial cells and on acrylic surfaces is a prerequisite for infection. Lyon and Chick  showed that in several patients, a more profuse growth of Candida was collected on the denture surface than from the mucosa. A number of studies were conducted to evaluate the correlation between the physical, mechanical properties and antifungal activity of the surface-charged resins. Hence, the present study was conducted to examine the physical properties (flexural strength and surface roughness) of surface-modified denture base resins for its suitability as denture base material. This experimental resin is made by copolymerization of MA to PMMA to produce a negative charge. As the experimental resin gives a negative surface charge to PMMA, it will hinder the initial adhesion interaction through repulsive electrostatic forces. In addition, a negative charge may increase the presence of protective cationic antimicrobial peptides in the pellicle. Giving PMMA an anionic surface charge is a way of increasing its hydrophilicity and preventing adhesion of less hydrophilic microorganisms, reducing the patient risk of developing denture-induced stomatitis. Acrylic surface topography and the presence or absence of saliva on acrylic surfaces directly affect adsorption of C. albicans. Park et al. investigated the effect of surface roughness of resin composite on biofilm formation and suggested that surface topography (size and depth of depressions) may play a more important role than surface roughness in biofilm formation. Yeasts are known to adhere quite strongly to denture base materials as a result of the microporosity on the denture surface. Without this adherence, microorganisms would be removed from the oral cavity when saliva or food is being swallowed. Hence, in this study along with the flexural strength, alteration in surface roughness of denture base resin material after addition of MA was measured. Roughness parameter (Ra) was analyzed because it represents the arithmetic mean of all the roughness values within the covered space on a certain surface and therefore being the most indicated value. The mean flexural strength of control group, Group B, Group C specimens is as follows: 70.45 Mpa, 69.64 Mpa, 67.99 Mpa with a standard deviation of 2.38, 2.27, and 2.03, respectively. All the values were well above the minimum value according to the ADA specification number 12, which is 65 Mpa. The surface roughness change was not significant with a slight increase in Ra values. The mean Ra values of control group, Group B, and Group C are as 1.247, 1.262, and 1.335 with a standard deviation of 0.50, 0.64, and 0.49, respectively. Decrease in the flexural strength and a slight increase in the surface roughness were observed when the ratio of the MA increased in the proprietary monomer. Further modifications may be needed for the acrylic denture base resins to improve its physical properties while still exhibiting its beneficial antifungal and antibacterial characteristics. Recently, methods such as applying the concept of nanotechnology to modify the denture base resin are also giving good results. Literature suggests that the surface-charged resins can be further modified to increase its physical strength to achieve both biological and mechanical standards. Nandal S, Ghalaut P, Shekhawat H. New era in denture base resins. Dent J Adv Stud 2013;1:3. Nikawa H, Hamada T, Yamashiro H, Kumagai H. A review of in vitro and in vivo methods to evaluate the efficacy of denture cleansers. Int J Prosthodont 1999;12:153-9.
el-Charkawi H, el-Said EA, Safouh HM, el-Raghi N. Effect of addition antimicrobial agents to denture reliners. Egypt Dent J 1994;40:785-90. Imazato S. Antibacterial properties of resin composites and dentin bonding systems. Dent Mater 2003;19:449-57. Park SE, Periathamby AR, Loza JC. Effect of surface-charged poly (methyl methacrylate) on the adhesion of Candida albicans. J Prosthodont 2003;12:249-54. Pesci-Bardon C, Fosse T, Madinier I, Serre D.In vitro new dialysis protocol to assay the antiseptic properties of a quaternary ammonium compound polymerized with denture acrylic resin. Lett Appl Microbiol 2004;39:226-31. Chandra J, Patel JD, Li J, Zhou G, Mukherjee PK, McCormick TS, et al. Modification of surface properties of biomaterials influences the ability of Candida albicans to form biofilms. Appl Environ Microbiol 2005;71:8795-801. Lyon DG, Chick AO. Effect of surface-charged poly (methyl methacrylate) on the adhesion of Candida albicans. Dent Practit 1957;7:212-7. Matalon S, Slutzky H, Weiss EI. Surface antibacterial properties of packable resin composites: Part I. Quintessence Int 2004;35:189-93.